If your backyard is suddenly home to conspicuous holes in the ground, you might be looking at the fine work of a rabbit. While not all bunnies are big on digging holes in the ground, many of them embrace this innate behavior. Rabbits employ their sturdy front paws to dig holes. Humans appreciate their privacy when it comes time to rest, and rabbits aren't too different in this respect. Bunnies dig holes as spaces for sleeping. They exit their cozy burrows when it's time to look for food. Holes also operate as safe havens for many rabbits. If a rabbit is in fear of a potential predator, he might just conveniently retreat to his burrow to stay under the radar. Some prominent predators of rabbits include cats, owls, foxes, weasels and even humans. Since rabbit burrows are such safe spots, the mothers also give birth to their offspring inside of them and use the burrows as dens. When rabbits dig holes, they generally "oversee" the land that directly surrounds them. This land is designated territory for them. Their turf usually isn't too big, as they prefer remaining close at all times to their burrows. If they stray too far away, they risk not having the option of quickly fleeing into their burrows, should predators come their way. Rabbits typically don't go looking for sustenance outside of their territories. Rabbits frequently construct their burrows in clusters with others. These are called "warrens." The male residents of the warren typically are in charge of protecting them. Many domestic rabbits also are avid digging enthusiasts, just like their wild kin. Some rabbit owners provide provide digging units to help their furry pals satisfy this natural need. Plant containers with soil, wood shavings and sand are all frequently used for these purposes. Not only do they often keep pet rabbits happy and busy, they stop the little critters from looking elsewhere to dig, such as your immaculately picturesque backyard garden. Digging units give rabbits the impression of being outside, even when they're safe and sound inside of your home. Digging behaviors in rabbits, in most cases, depend on their species. Cottontail rabbits refrain from digging behaviors. They often opt instead to take over empty burrows that were previously established by other creatures. 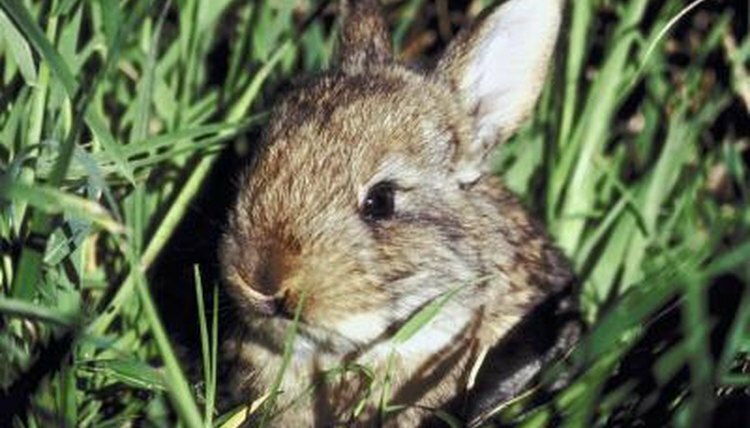 Pygmy rabbits, in stark contrast to cottontail varieties, are big burrowers. Hares, as fellow lagomorphs, might look much like rabbits, but they differ in one major way. While hole digging isn't at all uncommon in the bunny world, that behavior doesn't really exist among hares. Instead of digging holes, hares establish "forms" in the grass. Forms are cavities that follow the outlines of hares' physiques. Why Do Moles Dig Holes? What Does It Mean When Your Rabbit Stamps Its Feet? Are Skunks Good or Bad for Your Lawn? What Is a Fox's Shelter?